ElastoScan applies strain imaging technology which displays gradient value of tissue displacement via color map. 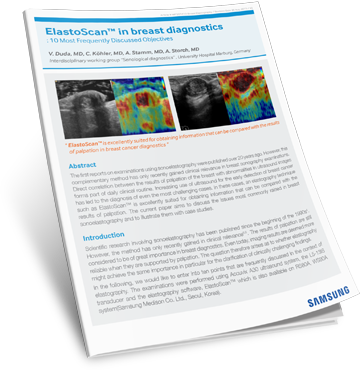 Users gain information on tissue stiffness, can detect malignant diseases early, and obtain automatic calculated strain ratio between target and reference area with just one selection of region-of-interest (ROI) on breast ElastoScan image, providing efficiency and intuitiveness. This white paper reviews the 10 most frequently discussed objectives in the context of elastography. The exams presented were performed using the elastography software, ElastoScan.